Two months ago today, the Red Sox officially said their goodbyes to Tito with a less than forgiving sendoff. With Ben Cherington stepping into Theo’s spot, Red Sox Nation sat by idly, waiting for his first move to be made. Shortly after a weekend of thanks that all Boston fans would approve, the Red Sox created their own headlines. 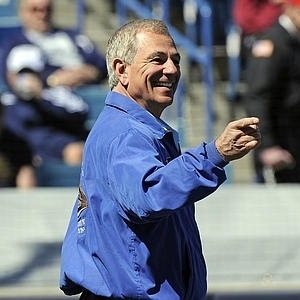 Rumors surfaced from sources close to the situation late Tuesday night that Bobby Valentine would take the helm at Fenway as the Red Sox 45th manager. With two months of built up anticipation for this very moment, it could have only been expected that Red Sox Nation would let their voices be heard about their feelings for the newly selected manager. From MLB analysts around the country to local sports figures, the opinions seem to be split down the middle. They either love it or hate it, nothing in between. Personally, I think it’s a good move. Granted, it may be due to the fact that everything we’ve heard about the Sox for the past 3 months has made me want to slit my wrist, so some positive news is a bit uplifting, but I think Valentine has potential. He’s a guy that knows baseball, plain and simple. He knows how to prep a team and come out on top. I mean as recent as last year he was in consideration for several other managerial spots with the Marlins and Orioles before staying on as an ESPN analyst, so he must be doing something right. He just wanted to hold off until a real team offered him a job. Sorry Nons. Seriously though, the Sox need this kind of boost, especially after our recent collapse. I think it’s definitely going to bring new life to the club. The Red Sox are expected to officially announce the move sometime Thursday. This entry was posted in Red Sox and tagged Bobby Valentine, boston, bsb, manager, mbl, Red Sox, red sox nation, sports, tito by jtulz07. Bookmark the permalink. I am just thrilled that they actually made a decision! As long as he leaves the mustache at home, we’ll be fine!